I usually do not send thank you notes to people I buy things from. This is different. This was not just a thing that I purchased. It was a magical experience that I could not have had if you had not made it possible. Thank you for doing that. I have been enjoying paddling my Coho now about once a week since I finished it in November. Looking forward to better weather so I can paddle after work as well. 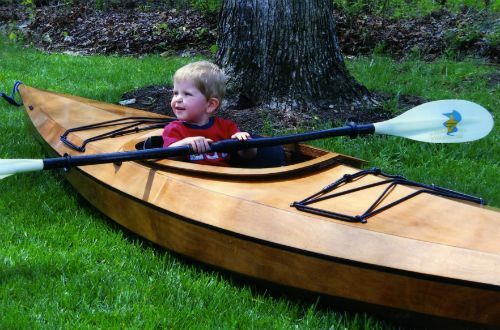 What a great kayak! I want to say a sincere thanks to you for creating the Pygmy Boat kit and sharing this experience with the world. It is hard to capture in words what this experience is like for someone, like me, who works at a desk job. Watching your labor take on a tangible beautiful shape is such a thrill when compared to pushing paper from one side of a desk to another! The time I spent building my boat was very rewarding. I do not think any other project has given me so much joy. It is really hard to say which I liked better; building the Coho or paddling it. I am hooked on it and I must build another! Just a quick note to let you know what a great experience I had with building my Coho. I am not a handy person and have not had any experience working with wood or fiberglass. The kit fit together perfectly and with the instructions given for the fiberglass, the fiberglass went on easily. What an awesome feeling it was putting my kayak in the water for the first time, the second time and the third time and so on. Every time I take my kayak out, I have this feel good feeling. 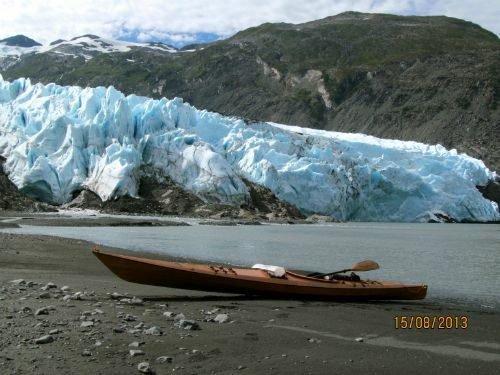 I find that I receive a lot of attention when I take my kayak out, whether it be stationed on my lawn, the top of my car, or at the lake, people come over to admire it. My schedule will slow down for me in April or May and I plan on ordering another kit at that time. My next kayak to build will be the Arctic Tern. Building my Coho has been great fun and a great way for me to relax in the evenings. You have put together a great kit. Truly an awesome product. I thank you and your staff for the great experience this has given me. I’m presently putting on the finishing touches on an Arctic Tern and wanted to send you a note. Earlier this year I purchased and built a Coho for myself and was thrilled with the results. The boat has handled better than I could have even imagined. The Arctic Tern is being built for my wife but I do hope she will let me try it out. The Tern is a nice looking boat and between the two I can’t choose a favorite in overall looks and appeal. I’m a manufacturing engineer for a major yacht builder on the North Carolina coast so I have a special appreciation for your attention to detail and the quality of your kits. 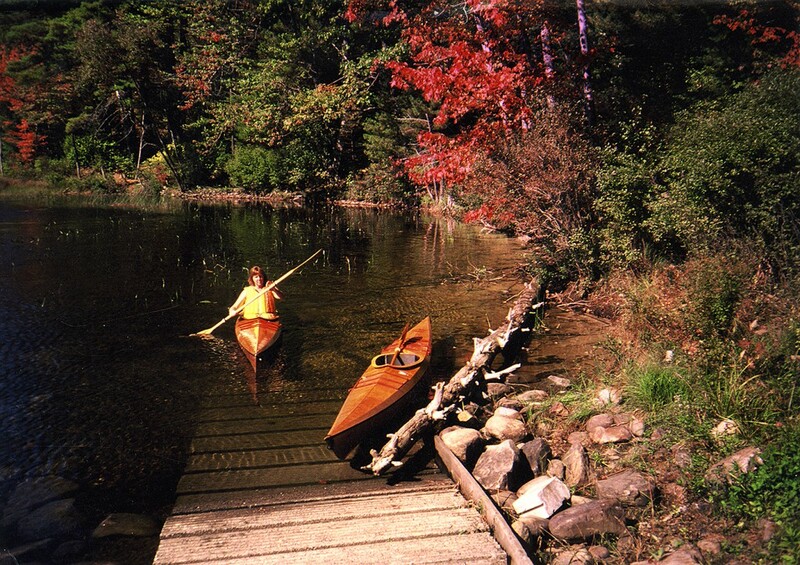 It has been a source of relaxation and enjoyment building these kayaks and I look forward to spending lots of time paddling the coast and tributaries near our home. 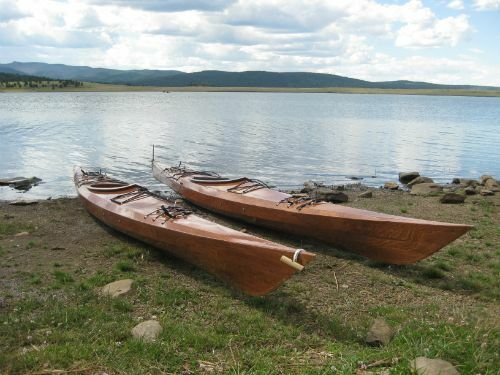 I’ve been kayaking for about 18 years and am pleased to find two perfect boats. Thanks again. Throughout the process of building my Coho, I kept thinking about John Lockwood. When I decided to build my own kayak, I did a lot of research… and now after many wonderful hours of extraordinary performance and paddling pleasure on lakes, bays and the open ocean, I can say without hesitation that this is a boat designed by a kayaker who happens to be an artist. So like the reviewer in Sea Kayaker said, “it’s a real headturner.” But what no one can know until they become a customer is how wonderful you people are and what a wonderful culture you folks have created within this company. Bright, highly competent, nurturing and always available. All of you deserve the best. Thanks for making me feel like family and for being so supportive. I hope to meet you soon. Until then… my compliments to the chef! Last year I purchased and built a Coho Hi. It was a fun experience building the boat. I was amazed at how well it turned out. My children tease me that i never finish anything. ha ! but not the pygmy. Since then it has been to numerous local lakes and the Florida Keys for a two week adventure. 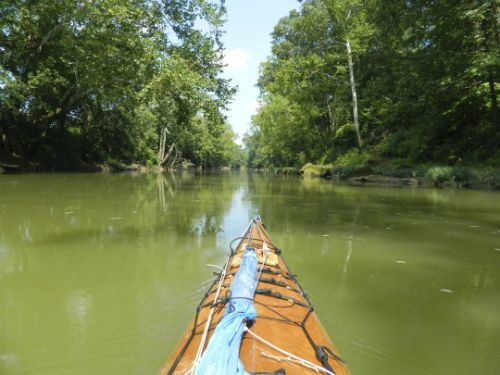 I just finished a trip paddling from Athens, Ohio to Waveland Mississippi via the Hocking, Ohio and Mississippi Rivers and the Gulf of Mexico. About 1,500 miles of paddling. I am happy to report the boat was spectacular. It held weeks worth of food, all my camping gear etc and kept it all dry. Everybody I met commented on what a beautiful boat it is. I was happy to spread the word that not all kayaks are plastic. By the way the Mississippi River is beautiful. I’ve included a couple images. Thanks for making a quality product that exceeds it’s descriptions. Now I have to decide whether to build a double or a single for my wife. What a great project! I hadn’t done anything like this since I was a kid making airplane models, but the project was very easy and fun. Your staff was very helpful on the couple of occasions when I needed telephone hand-holding. I launched my new Coho this spring and it handles like a dream. A rudder is definitely not needed. I’m already pondering which model to make for my wife. My son and I just completed our Coho in March of this year. The kit was very well designed and the instructions were extremely clear. It was really fun to build. We were both amazed at what a beautiful kayak we ended up with! I have enclosed a picture of our completed Coho with my grandson, who was the first to sit in our boat. We have launched it and it handles beautifully. We plan to build an Osprey Triple this summer… Thank You! 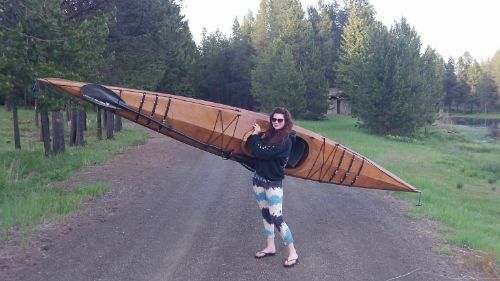 My Coho kayak is completed and it is fantastic! I built it in my garage over a period of about 6 months, so there was no rushing involved. I launched it in July and it performs beautifully. I enjoyed working on it so much I would love to build another one in the future. The instructions were clear and the kit pieces went together perfectly. 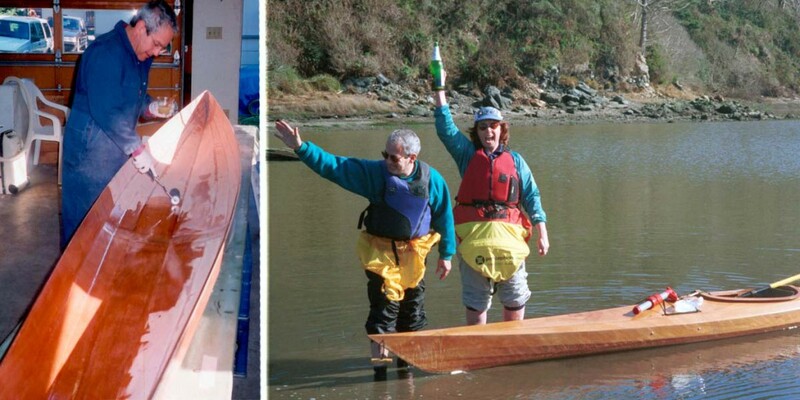 I have already recommended your company to a friend who plans to build a kayak one day. Thanks for the great service, design and workmanship that resulted in my kayak. 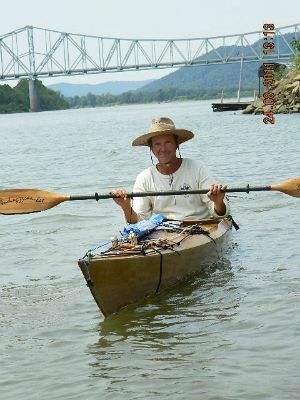 The picture of me with my kayak was taken at its launching by my daughter, Amy. Just wanted to let you know how pleased I am with my recently completed Coho and to say thanks for your courteous and helpful service. My boat arrived the day after I ordered her, with construction beginning the day after that. She was completed in just under two months, in a total of 115 hours, which included the hatches, bulkheads, thigh braces and rigging. My wife and kids were concerned about my obsession with her construction to the exclusion of all other activities. But with very few excpetions, the majority of the work was done in 1-2 hour evening sessions, after T-ball practice and swim lessons were over and the kids were in bed. 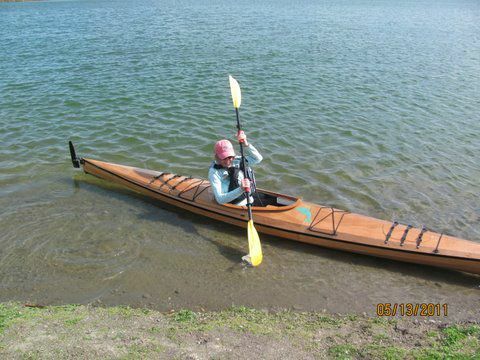 The fact that it seemed like I was spending so little time working on her, most people doubted my ability to complete her by the summer paddling season. The kit is so well designed that steady progress is apparent after every hour spent (excluding sanding of course). The result is a strikingly beautiful boat, that elicits praise and admiration from everyone who has seen her (just wait till I get her varnished!). I recently returned from a 4 day paddle trip in the Canadian Gulf islands (her first real test), and couldn’t be happier. She is an exceptional boat, with what I consider to be a good balance of the characteristics I was looking for: she tracks relatively well, is highly maneuverable, and is surprisingly stable (especially when loaded). My biggest concern, the ability to keep pace with my friends’ doubles, turned out to be unfounded. She is quick and glides through the water seemingly effortlessly. My concern about my inexperience in paddling without a rudder has also not posed any problems. Although certainly not required, I am still considering installing one to increase her versatility. Thanks for providing an alternative for a high-end touring kayak at an affordable price. It has been a thrilling project and promises to be a source of enjoyment and pride for many years to come. Just a quick note to say building a Coho is fun and rewarding. I walk around with a smile on my face every time I take it out. People are amazed that it is a kit, the next question is always, “How much does it cost?” On our maiden voyage to learn basic skills with an outfitter, the instructor did not want me to use the Coho as “It is too beautiful to beat up.” He recommended I use one of the Tupperware boats to learn in and when the lesson was over to then take the Coho out. After the lesson, the Coho went in and what a difference! Stability up the wazoo! The instructor took a test run and wanted to know if I would barter a one week Baja trip for it. Hmmm… don’t think so. My counter offer was the Baja trip for build time only, he would have to pay for the kit and supporting materials. Hmmm…. he’s still thinking about it. Thanks again for a great product and count on another order soon. About one year ago, I completed a Coho Kit. The construction process was clearly presented in the instructions and the customer service people were helpful. However, the purpose of this is to let you know that I am very pleased with the durability of my Coho. I was a little concerned having previously paddled mostly plastic boats, but my Coho has held up very well in the last year despite pretty harsh use. 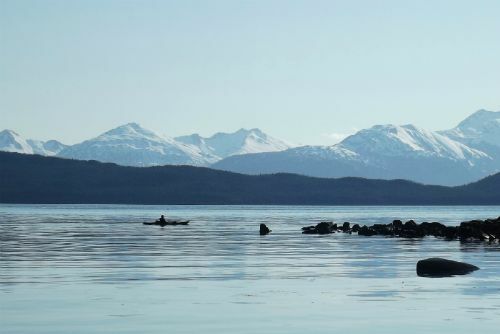 Last summer I worked for five months out of my Coho as a sea kayak guide in Haines, Alaska, where the boat weathered daily use on rocky beaches, in the wind and on and off a trailer. The supreme vote of confidence in my Coho came while surfing off the coast in northern California. While on a steep break exploring the performance of the boat while purling, I pitch-poled twice and she appears no worse for the wear. Thank you for designing such a solid product. I would first like to express my experience with my first Coho, which I just finished building and have been cruising the Columbia and Wenatchee Rivers in. 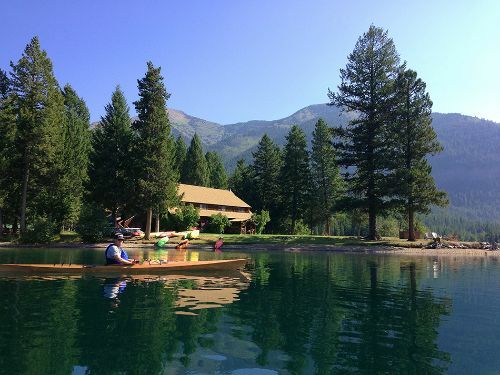 It has become quite the conversation piece among may in the paddling club in Wenatchee. The building process was simple and quite enjoyable. 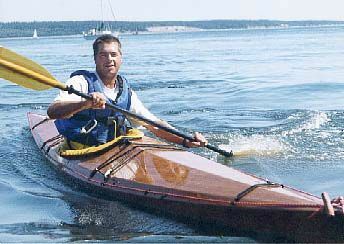 The responsiveness has made my first experience with kayaks easy to learn and fun. I am ready to begin building a second Coho for my wife who loves the boat as well. Enclosed is the money. Thank you and I look forward to building this one as well. 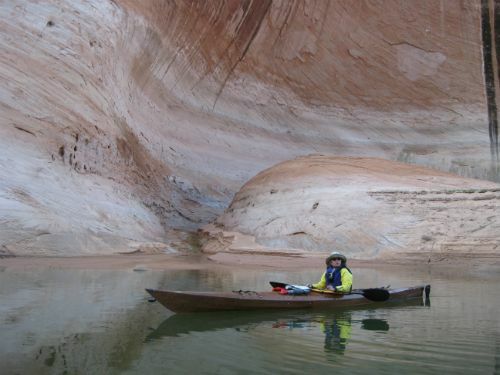 The boats get rave reviews for their beauty wherever we are kayaking. We chose the Cohos after spending a day at Pygmy boats paddling various models, which was invaluable in making our decision. When we arrived, we intended to get only one boat. 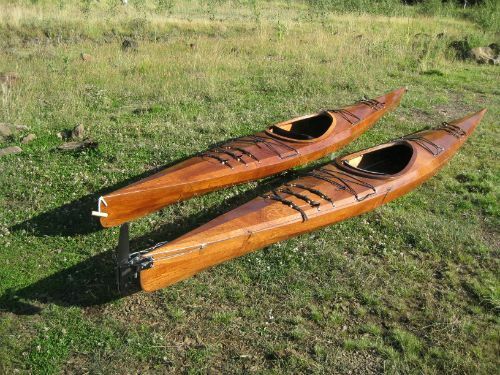 We purchased two after having such a great experience in the test paddle. Building these boats was a pleasure, because of the absolutely phenomenal set of instructions provided by Pygmy boats. They were unquestionably the best I have ever used for any project. The amount of detail was just right, allowing me to be confident in each step, and to avoid pitfalls and/or mistakes. Every time (which thankfully was not too often) when a step didn’t turn out exactly as anticipated or hoped, it was because I hadn’t taken the instructions literally enough or read them carefully enough. 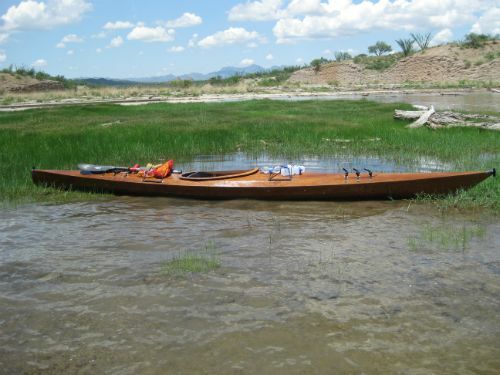 The only advice I would give is to those in extremely dry climates (such as Arizona) is to build the boat soon after getting the kit, to minimize the amount of bowing, twisting, or cupping which occurs with drying of the plywood. Having said that, my multiple calls to Pygmy boats for advice of how to deal with those issues, or any other, were answered promptly, helpfully, based on experience and not just conjecture, and with unending encouragement. 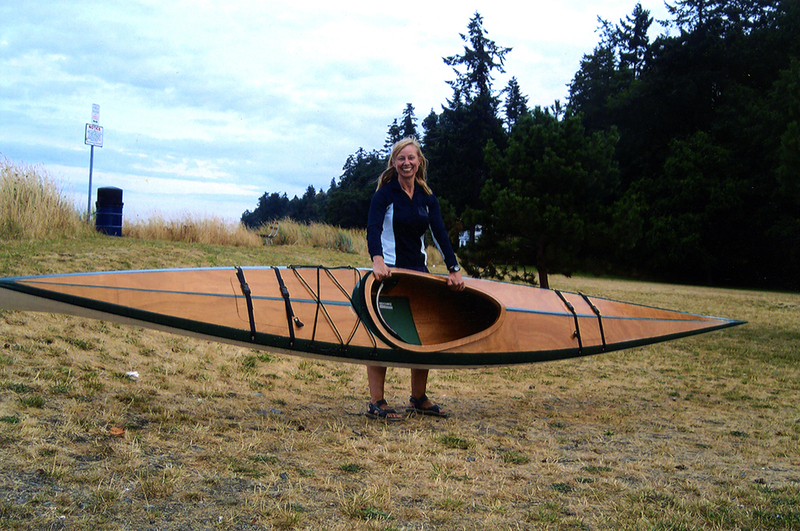 I wanted to write and compliment you on making such a fine boat design… The one thing you didn’t tell me is just how much time I would have to take with other kayakers and people in general. Everyone thinks it is beautiful and wants to know all the details. I spend almost as much time talking about the boat as I do paddling. After finishing the hull with varnish I plan on taking a trip with another of your satisfied customers to Smith Island on the Chesapeake Bay. Tom Mellies has an older Queen Charlotte, the two of us will spend the better part of a weekend paddling around the island and then on to Crisfield. Expect photos of the two of us and my beautiful Coho. This spring I finished my Coho and now that I have an opportunity to use it in a variety of situations I would like to share some observations. The design of the triple chine hull is an unqualified success. In perfectly still water there is almost no wake, in short choppy waves the fine entry makes the boat seaworthy and gives it an exceptionally smooth ride. 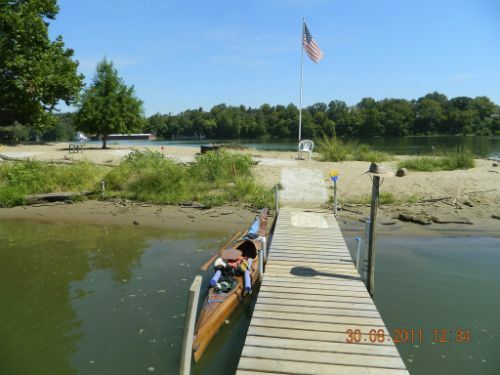 The deck sheds water very effectively and the chine in the deck, which appears to be a Pygmy trademark, makes paddling easier and more effective. I have looked at many stitch and glue kayak plans and most are in aesthetics no match for my Coho. A couple of photos are enclosed. One with the cedar strip boat which appears bigger but is in fact six inches shorter. It clearly shows the rocker of the coho. The other difference is more significant in that I manage the boat by myself. This is far easier than with heavier boats, especially commercial ones. This fact is too frequently overlooked when choosing a kayak; 10 lbs matter more out of the water than when touring! Again, my compliments on this design. I am very happy with it and the boat draws much attention everywhere. The Coho went together well. I started the Coho on the 2nd of September and had it in the water on the 19th. I enjoy the endless comments, and all the oohs and aaahs, and the best part is the beautiful way it handles. I found that I could not and did not want to cut the deck. The sea sock is working out beautifully. Thank you for making a wonderful boat kit. I just received your newsletter and had to send you this shot from my Coho earlier this year. The times I’ve spent in my boat have been some of the best moments of my life. BTW, this shot was accepted into the Alaska State Museum’s highly competitive ‘Alaska Positive’ photo exhibit. It will spend the next year and a half on exhibit in Juneau, Anchorage and Fairbanks. Thanks again for a great product!!!! Saturday I took my first paddle in my new Coho kayak. It was a beautiful day and our trip was 11 miles (nautical) around part of San Diego Bay. I was delighted! I am a real estate analyst. I am good with my hands but not a craftsman. From layout to launch was exactly three weeks. The completed boat has some drips, sags and other imperfections but final sanding will eliminate most of them… I had fun building the boat and I did it in addition to working 8-10 hours a day. Your instructions were excellent and I appreciated the answers I received from four phone calls. I often paddle with my brother who has a Seda Viking. We paddle between 3.7 and 4.0 knots. With the Coho I had to hold back to stay even with him. I also find no need for a rudder… My thanks to you and all of your staff- I expect to have a great time with my Pygmy Coho! I’d like to thank you for all your advice. The trials and tribulations of the last few months have subsided and been replaced with glorious memories of paddling the Thirty-thousand islands, the remote coast of Lake Superior and the turquoise waters of Georgian Bay along the exposed cliffs of the Bruce Peninsula. The Coho tracks like an arrow, carries a ton of gear (what a luxury to have the space to haul along a 6 person tent on a kayak trip!! ), handles big water well without a rudder and gets more than a little attention from casual on-lookers and veteran paddlers alike. 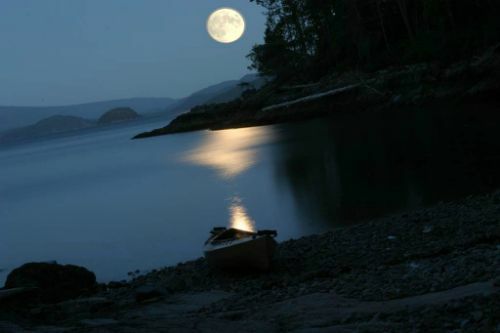 I could almost see trading in my white-water canoes- almost! Thanks again. She’s a pleasure to paddle. I have had the privilege to watch two kayaks being built side by side this winter– one a Pygmy Coho and the other a CLC competitor. Without any hesitation I am ready to purchase the Coho. For reference I am a 5’8″ 210 lb man in reasonably decent shape. 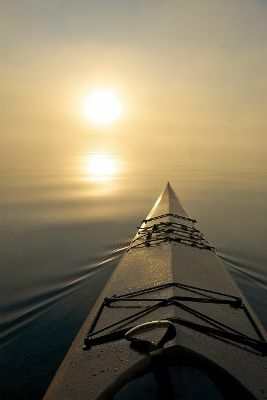 I am a novice paddler, but I am intent on changing that part over the next few years. Looking forward to hearing from you! As I glued the deck on the hull of my Coho tonight and felt the same rush of satisfaction that I had when I did the same on the Osprey and I knew I just had to express my gratitude to you folks. I bought both kits from a gentleman in Bothel, WA off craigslist that had started the Osprey but never finished and never touched the Coho. I hope it is of some merit that I paid him the full price that he had paid for the two boats when he originally purchased them from you and did not not try to barter even though I probably could have. 20 years ago a dear friend of mine in Ketchikan Alaska invited me into his basement to take a look at his project. He was building two CLC Kayaks and I was instantly convinced that this was something I simply must do in my lifetime. After many life changes I found myself in a position where I not only needed a hobby but also needed some purpose in life. I did a bit of research and became convinced that a Pygmy boat was what I wanted and my adventure began. The joy and satisfaction that I have received from this endeavor is difficult to describe but I think the attached photo of my 16 year old daughter holding her prized possession says it all. My Coho will be complete in a matter of days and my daughter and I will certainly have many years of making memories in these two pieces of art. I have every intention of building many more with my next to be the Borealis and who knows from there as so many of my friends and family have requested that I build one for them. The point of this message is to express my gratitude to a man that made his passion into a business of sharing. So many people in this world choose wealth over passion and although I have little doubt your business is financially successful I’m quite sure that the pursuit of wealth would not have led you to where Pygmy is today, rather sharing your knowledge and expertise is obviously your priority. Thank you kind sir. Thank you Pygmy staff. I have always been a very handy and capable man but without you I could never have accomplished the completion of such a beautiful gift to such a beautiful daughter and that is something that nobody can put a price tag on. Congratulations on the Coho Vote! John and Company…way to go! !…..But then I’m not surprised. My Coho has been impressing me and all the others that paddle her for the last 10 years. Keep your focus in making the best kits out there.